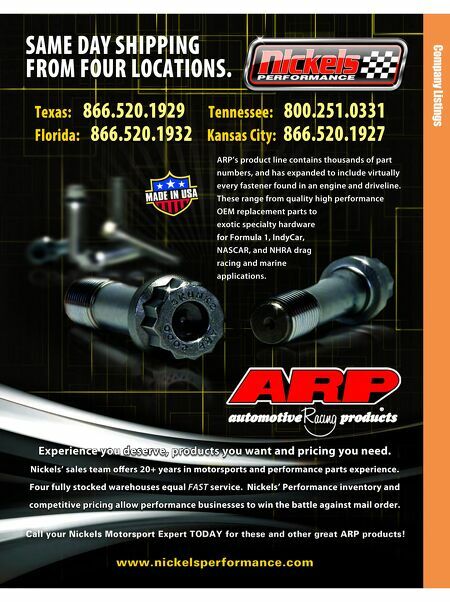 March 2015 n Performance & Hotrod Business n 89 A roundup of the hot rod & performance aftermarket's suppliers, products & services. 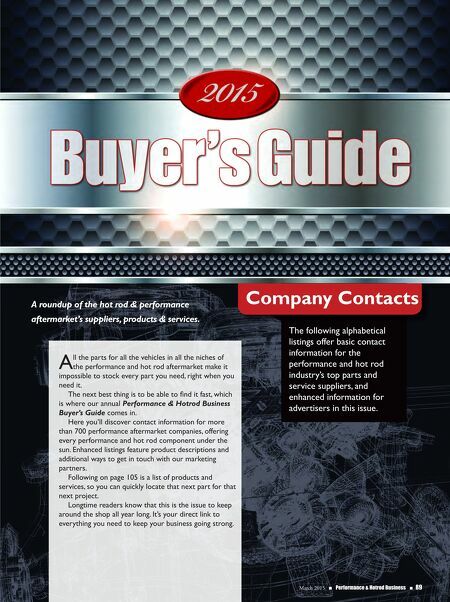 The following alphabetical listings offer basic contact information for the performance and hot rod industry's top parts and service suppliers, and enhanced information for advertisers in this issue. Company Contacts A ll the parts for all the vehicles in all the niches of the performance and hot rod aftermarket make it impossible to stock every part you need, right when you need it. The next best thing is to be able to find it fast, which is where our annual Performance & Hotrod Business Buyer's Guide comes in. Here you'll discover contact information for more than 700 performance aftermarket companies, offering every performance and hot rod component under the sun. Enhanced listings feature product descriptions and additional ways to get in touch with our marketing partners. Following on page 105 is a list of products and services, so you can quickly locate that next part for that next project. Longtime readers know that this is the issue to keep around the shop all year long. It's your direct link to everything you need to keep your business going strong.